There is perhaps nothing more important for orienting and conducting human affairs than wisdom. The rational decision-making process describes an idealised approach for solving problems and making changes for the better and, unfortunately, sometimes for the worse. For a description of how one uses the Rational Domain, see Transforming the Rational Decision Making Process. Since the advent of the Enlightenment some 300 years ago, we have put so much faith in rationality that we have largely ignored the importance of relationships, both between peoples and between us and the world around us. There is no doubt that the Enlightenment and the application of rational thinking has brought about incredible advances through the industrial age and now in the post-industrial age. But there have also been adverse consequences which are now clearly recognisable in this era of globalization. The many issues facing us today are interconnected systems. Poverty, inequality, terrorism, climate change, sustainability, deforestation, resource depletion are examples. But having, say, a ‘War on Terror’ on its own will not end terrorism. A ‘Stop the Boats’ policy on its own does not solve an international humanitarian crisis. An integrated, holistic, systems approach is needed and this requires an understanding of relationships. As physicist and author Fritjof Capra reminds us, relationships are a central characteristic of systems thinking. A framework is designed to show relationships and boundaries. 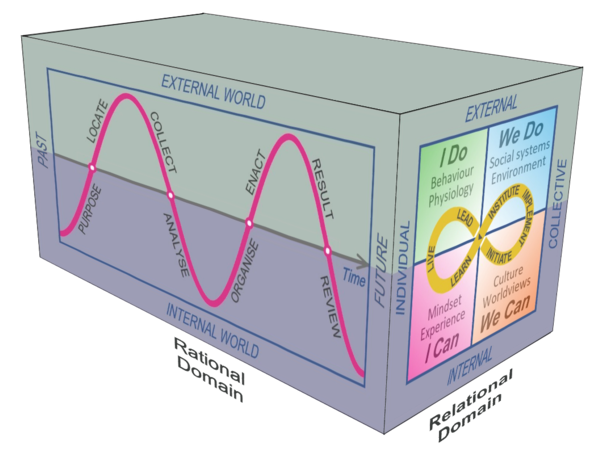 In the case of the Can-Do Wisdom Framework, the relationships are between the boundaries of the internal world of what is in the mind of people and the visible external world of the natural and human environment on the one hand, and between an individual and the collective. A collective could mean anything from a family unit to an organisation to a nation state. The Individual-Internal or I Can quadrant is where my knowledge, experience, my discoveries and my mindset of how I think about the world resides. This remains hidden to others because it’s in my internal world. We learn mostly from others – parents, teachers and those in authority. We learn from books and multi-media sources. We learn from watching what others do and what they say. We can also learn by simply observing the world around us, and from the results and consequences of our actions. In the individual-external or I Do quadrant, my physiology determines what I am capable of physically and my behaviour is what others can observe. This is where I can share my experience with others through speaking, through writing or doing. In the collective-internal or We-Can quadrant is where groups and societies operate internally and where there are different worldviews or interpretations of how the world works. Worldviews are influenced by the culture of a particular people or society – their ideas and customs. Some groups are wanting to make changes while others are determined to stay with the status quo. The collective-external or We-Do quadrant describes the built environment, which is the human-made space in which people live, work, and play on a day-to-day basis, while systems include the institutions, business processes, and technology – such as transport systems and communications infrastructure – that continually evolve to allow a society to operate efficiently and safely. 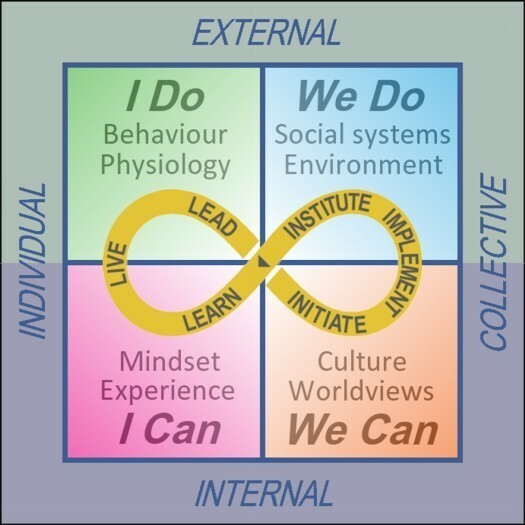 In living systems these four quadrants are interconnected by activities of learn-live-lead for an individual and initiate-implement-institute for the collective. This pathway takes the form of an infinity symbol – a never-ending loop – as shown in the figure above. In summary, my behaviour (I Do) is moderated by the culture and sub-cultures I am part of (We Can) – via the social systems I subscribe to (We Do) and their influence on my mindset (I Can). Live – being authentic, true to oneself, having courage and determination, instilling trust. To Live is to experience life – even before birth. As John Henry Newman wrote, “To live is to change, and to change often is to become more perfect.” Live is the link between I Can and I Do quadrants. “I live, therefore I am alive”. A change initiator is someone with an insight for needed change but doesn’t necessarily have the desire, the time, the power or authority to implement change where others are involved. This person could be anyone from a new or existing low-level employee, a sales person, a customer or a CEO. A whistle-blower could be considered to be a change initiator. A change instigator is a person who urges or incites others to bring about change. New technology could also be the catalyst for change but it still requires someone to be the change initiator. A change initiator is an I Can-I Do person. A change agent is an individual who has the skills and experience to work with others in facilitating the change process. This person could take over from where a change initiator leaves off and may bow out at the time of implementing the change. A change initiator usually needs to convince a change agent or agents to come on board if the proposed change is to succeed. A change agent could be an internal employee or an outside contractor. A change agent is a We Can-We Do person. A change master or changemaker is someone who combines the change initiator, change instigator and change agent roles and is involved in the on-going success of the change initiative. Change masters generally focus on changing the world through technological innovation. Changemaker is a term coined by Bill Drayton, founder of the social entrepreneurship organization, Ashoka. A changemaker is a person who aims to address a social, environmental or economic problem and strives to make change happen in creative ways. Another associated term is that of social entrepreneur – a person who tries to solve social problems using entrepreneurial skills. These are true Can-Do change persons covering all four quadrants. Anyone can be a change initiator but many give up in the face of opposition to change. Change instigators are not afraid to challenge the status quo. Change agents have additional skills and position power to be effective in encouraging change in teams, organisations, or society. A change master or changemaker is the ultimate and the most difficult to achieve, not just because of the skills needed, but due to the fact you may need to be in the right place at the right time. The infinity symbol reminds us that this is a continuous process and has been going on for millions of years. The highest form of leadership is to teach others to lead. And even the greatest thinkers, such as Isaac Newton or Albert Einstein, actually built on the contributions of others before them. Individual wisdom can be described as the process of learning, living and leading change for the common good. Collective wisdom can be described as the process of nurturing, creating and instituting change for the common good. We’ve lost wisdom. Wisdom was making decisions on how will this affect our people generations ahead. Now people don’t seem to care about generations in the future. It’s all about making money, struggling to live if you’re very poor, taking more than you should if you’re not very poor. And making money – the bottom line – making shareholders money – the next political campaign – me – now! Wisdom must be brought back, but how? Firstly, the change loop needs open, transparent communications to achieve wise outcomes. Communication is the lubricant of the change loop. Lack of transparency means there is a clear danger of unwise outcomes. Deceiving someone by concealing or misrepresenting the truth is an example of lack of transparency. Cultural differences can also be a major cause of communication issues and are especially important in international relations. Secondly, ignorance, prejudice and delusion are some of the enemies of individual wisdom. If an individual believes something that is not true, their learning is deficient. Then what follows on the Learn-Live-Lead change path will also be deficient. The result of the change is unlikely to be for the common good and therefore unlikely to be wise. It’s even more dangerous when these individuals have the position and the power to persuade others with their deceit and delusions. Unfortunately it happens all the time. What is needed is the ability of individuals to act as change instigators, change agents and change masters to set the balance right. As others have said before me, wisdom is not a man-made construct. It was not invented by the Greeks. Instead wisdom is integral to nature and goes back to the multicellular organisms that first appeared on this planet around 600 million years ago. Multicellular organisms rely on communications for their mutual benefit and later I will demonstrate how the change path can be seen working in animals such as humans as well as in superorganisms such as ant colonies and bee hives. Whereas the Relational Domain is timeless, the Rational Domain in Time Display has a focus on achieving results now or at least in the immediate future. 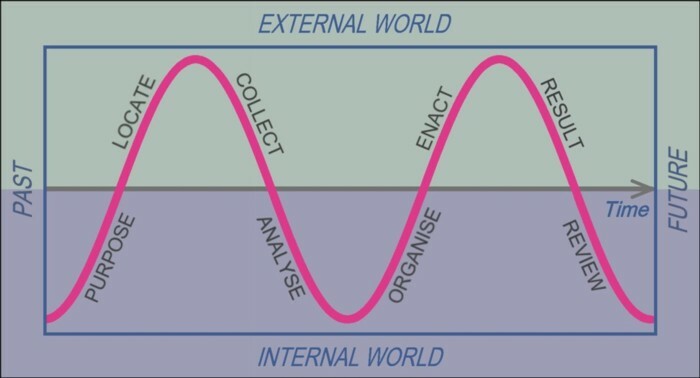 All transactional computer programs are based on this model. This above is a very brief and incomplete description which will be expanded further in later posts. The purpose of the blog is to expand on the attributes of the framework and relate it to stories of such change instigators, change agents and change masters and how change relates to wisdom. 1. Kessler, Eric H. 2007. Handbook of Organizational and Managerial Wisdom. 2. Capra, Fritjof. 1997. The Web of Life.